Brian's Bio: Brian Skerry is a photojournalist specializing in marine wildlife and underwater environments. Since 1998 he has been a contract photographer for National Geographic Magazine, covering a wide range of subjects and stories. An award-winning photographer, Brian is praised worldwide for his aesthetic sense as well as his journalistic drive for relevance. His uniquely-creative images tell stories that not only celebrate the mystery and beauty of the sea, but also help bring attention to the large number of issues that endanger our oceans and its inhabitants. His year-round assignment schedule frequently finds himself in environments of extreme contrast from tropical coral reefs to diving beneath polar ice. While on assignment he has lived on the bottom of the sea, spent months aboard fishing boats and traveled in everything from snowmobiles to canoes to the Goodyear Blimp to get the picture. He has spent more than 10,000 hours underwater in his career. Brian has also worked on assignment for or had images featured in magazines such as Sports Illustrated, US News and World Report, BBC Wildlife, GEO, Smithsonian, Esquire, Audubon, Men's Journal. Brian frequently lectures on photography and conservation issues having presented at venues such as The World Economic Forum in Davos, Switzerland, TED Talks, The National Press Club in Washington, DC, The Royal Geographical Society in London and the Sydney Opera House in Australia. He’s been a guest on programs such as NBC’s TODAY Show, CBS’s Sunday Morning and ABC’s Good Morning America. He is also the Explorer-In-Residence at the New England Aquarium. 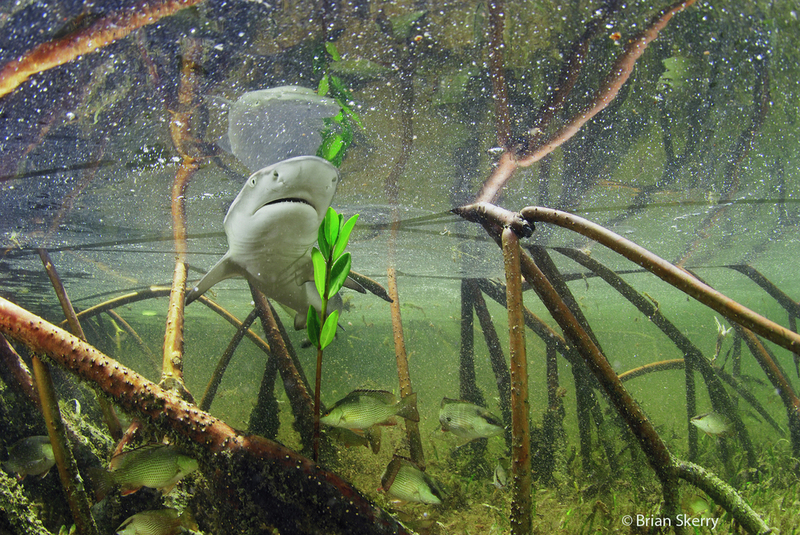 In 2010 National Geographic magazine named one of Brian’s images among their 50 Greatest Photographs Of All Time. He has had recent exhibits at Visa Pour l’Image in Perpignan, France as well as cities such as Geneva, Barcelona, Lisbon and Shanghai. An exhibit of Brian’s work is currently on display at the Smithsonian National Museum of Natural History in Washington, DC. be-7: [...] which came first, the ocean or the camera? Brian: The answer to that is, the ocean came first. I can remember wanting to be an ocean explorer from a very, very young age. As a young boy, I can remember looking at National Geographic Magazine and seeing ocean explorers, I can remember watching the early Cousteau documentaries and other programs about the ocean, and then just very much being inspired to explore the sea. I think it spoke to me on a level of discovery, it seemed like a place where there was still a lot of mysteries waiting to be discovered. [...] I remember, as a teenager, sitting in the audience watching photographers and documentary filmmakers present their work and sort of having this epiphany, where it was as if a light went on... I instantly knew that the way that I would explore the ocean was with a camera. be-7: [...] whenever someone is starting something new, I think there's that pressure-- to want to be great and want to be the best and want to be a master right away. Did you feel that when you started out with photography, were you critical of your early work? Or, were you patient and just, kind of, going with the flow? Brian: I think probably a combination of all of those things. I certainly, from the moment that I decided that this is what I wanted to do, was looking at the very well-established underwater photographers in the world and thinking about what it would take to produce that kind of work. It was very intimidating. You know? I came from this little, sort of blue-collar, working-class town in New England. Although I wasn't that far from the ocean, I didn't live on the ocean, I didn't really know any other underwater photographers... I knew some divers, but they weren't doing photography. The notion of setting my sights at this very lofty goal, wanting to be a National Geographic Magazine photographer shooting under water was pretty lofty; the odds were probably a billion to one. So, I was critical of my work in the early time [...] however, you would occasionally get a picture that looked pretty cool, I was doing things that were somewhat interesting. [...] you'd get the occasional gem that would give you the inspiration to keep going on. be-7: Now that the dream has come true, and you've not only become that master of photography, you've also used your photos for another purpose, and that's conservation and activism for the ocean. In terms of that progression, was it a conscious one, or did it just kind of happen? Brian: No, it wasn't conscious at all, and it did sort of just evolve. [...] over time, I began to see a lot of problems occurring in our world's oceans, things that I didn't think were necessarily on most people's radar, that these were things happening below the surface and unless you were diving on a regular basis, unless you were exploring the ocean, you might not know about it. You wouldn't know that 90% of the big fish in the ocean have disappeared as long as you can go to a restaurant and order a piece of fish, everything seems fine. I started to see these issues, I was reading about them, I was talking to scientists and other people who were sort of informing me, but I was seeing it in my own experience. I began to, as a journalist, feel a sense of responsibility, and a sense of urgency to turn my attention towards these things. It wasn't the fun stuff that I wanted to photograph, but I felt it was necessary... I cared about the ocean, I felt that if we at least knew about these problems, maybe we could do something to move that dial. But it was a delicate balance, because you didn't want to do too much of the doom and gloom because people would turn off. So you really had to thread that needle, where you were showing the celebratory, still showing the beautiful things, but showing the problems as well... and hopefully offering some solutions, some hope. be-7: [...] there's also the idea that if the type of degradation that was happening under water was happening on land, more people would be seeing it every single day and there would be more of a conversation, so how do you start that conversation without having people shut off? Brian: The things that I wanted to photograph were not always easy to photograph, but in terms of shining a light on practices or things that were happening in the ocean, I felt was essential if any change was ever going to happen in terms of protecting things, we needed to know the problems. [...] to give readers some sense of how fish are caught because it's very different than other forms of agriculture (and we can certainly acknowledge that there are problems in industrial farming and so forth). The difference is, with ocean harvesting of fish, it's done with wildlife and it's often done in a very indiscriminate fashion. So one of the pictures I made, for example, was a trawl net being used to catch shrimp under water, and a trawl net is this giant net that's towed behind a boat with two big steel doors on either side and it's very effective at catching the intended species, but it also is very good at catching everything else in its path. You could make an analogy that it would be like taking a big net and going through the forest, or any stretch of woods or wilderness that we have on land with the intent of catching a few squirrels or something, and in the process you're catching all of the song birds and all of the chipmunks and everything else... and all of that other stuff gets thrown away into a dumpster and you keep just the few squirrels that you were intending to catch, because that's exactly what happens under water. [...] these are things that are not necessarily evident to most people, they're not aware of that and photography has the power to bring that to folks in a way that will resonate in an emotional way. be-7: A lot of people, I have learned through conversations, are extremely fearful of being underwater. Do you have any blip of advice that you would tell someone who may be held back by fear and may not be inclined to dive, or even spend any time in the ocean? Brian: Well, it is, for many people, a very alien experience. I mean, for all of us, it's not natural for us to breathe under water. [...] I can remember doing it in my backyard swimming pool as a kid, and I still vividly remember what it was like... I was sitting in the shallow end in three feet of water and just poked my head under water, and the notion of being able to breathe three or four times in a row, was wild. I just couldn't believe that I was actually breathing under water. [...] I would encourage anyone who thinks that they might like it or has any interest in going in the water and seeing some cool things to take it slowly, to take it one step at a time. [...] for people beginning, it might be a little easier to make those first forays into the sea in a warm, tropical place. [...] and then just snorkel. You know, I think in the beginning if you just put a face mask on and you're kneeling down on a white sandy bottom and you can just put your face in the water and look around a little bit with a snorkel in your mouth, you will begin to lower the blood pressure, the anxiety will go away, and you'll slowly feel more comfortable. [...] once you begin to see things, if you see some colorful fish or some coral, or a little school of squid that swims by, all of a sudden your mind begins to forget about your anxieties or your fears of what could go wrong and you become engaged with all that you see around you. [...] everybody wants to be at the top, as you mentioned, right away, but if you take your time, I think you'll be far more rewarded. be-7: [...] how do you feel your personal rhythm is affected by the cycles of the years or the seasons or the tides or the environment, and the species within that environment, that you are traveling to? Brian: That's a really great question and I've never really thought about it per say, but I do think that my personal rhythms do tend to, eventually, mirror or mimic the places, or the animals that I might be with. [... however] as much as I do spend time in nature and as much as I absolutely love my work, it is a frantic pace. [...] this year for example, I have been [traveling] 11 out of 11 months, and it's going to continue, so it will be 12 out of 12 months and it will continue into next year. [...] and [so] to the degree that I can tune out a little bit from the rest of the world and be a little less on the grid and a little less stressed with messages coming in that sort of pull me back into the world... when I can get out in nature [for longer periods of time] and really take a deep breath and slow down a little bit, I think there is that relationship [synchronicity with nature] that we can find ourselves in and it's quite special. Wondering what Brian Skerry ate for breakfast on November 27th, 2015? Listen to the full audio above. Wondering what it would be like to be on a Subantarctic dive when you meet a 45-foot, 70-ton right whale who has plausibly never seen a human before? Listen around minute 19-23 of the full conversation for the true highlight of the interview. For me, it’s about the fact that these animals [right whales] are naturally curious and naturally trusting of humans... These things are not fantasies, they really do exist and they really can exist and I think we have to work at it. The ocean has been treated poorly for centuries, we’ve seen it as being too big to fail... What we see today is that it’s not too big, it is failing, and the animals are suffering and ultimately, we will suffer because of that.